The armors and blood fountains are from blood omen 1. That being said u could add maces (for mining and dealing extra tdamage to stone based enemies like golems), dual axes with each double sided axe crafted from 2 axes the point of which could be like in blood omen for obstacle clearing and doing added damage on plant based enemies which u could add to the black forest, which said mobs could b summoned by the nature guardian and increases chances of more desirable drops from said mobs. The blood fountains are also used by the prophets (lost seers of avernus)[see nosgoth game] who apparently r related to the religious avernus enemies and deleted witches from BO1, that being said they could be in terms of mobs like a witch variant that uses pistols and potions (so basically a better witch, that is friendly to villagers and turns vanilla witches into more prophets) so as such blood fountains should be a structure found in the wild that attracts vanilla witches and any that enter its radius of 3 blocks gets turned into a prophet. i guess they should be craftable too (maybe with some harder to get/late game materials so if you're playing as a human you could put in a village or something). The spectral dimension being a different dimension was so that mob-wise the player would only interact with spectral entities (ghosts, wraiths, slaugh, archons, etc) as well as warped structures and water being basically cloud-like. The fane was supposed to be the volcanic/smokehouse production area that was the territory of Turel and his clan who grants telekinesis (Morlock; a wraith vampire guarded an artifact that granted raziel TK projectiles). Soul Of Turel would be hard to do I imagine... maybe keybind the TK projectile button and hold it to inflict slowness on a hit mob w/in line of sight (w/ the particle effects from both teleporting endermen and charged creepers enveloping mob). As for actual volcanoes just do mountaintops topped with magma blocks and a lava source block that emits smoke. The Phoenix is not actually a phoenix, it's the Treshawk from the cancelled beastmaster class from Nosgoth(btw go on the legacy of kain wikia cuz that's where i'm basing a lot of my ideas from) the only reason i called it a phoenix was that i was harkening back to the bird mural from the tomb of the sarafan from SR1 (however that 1 is like ender dragon sized). I assume it would work like a tamed wolf but it would fly around and land when not mobile. I was thinking wild medium sized ones (see peacock/ostrich sizes from exotic birds mod) would spawn w/ their young (let's say chicken size) in the volcanic and mountain areas, while ender dragon sized ones would only spawn from a tamed medium sized one after feeding it a special mixture item (let's say its feathers, blaze powder, gun powder, bone meal, beetroot stew, rotten flesh, and vampire blood). They'd prefer to land/perch on elevated areas, or on fences and trees, and r like wolves were they r only hostile to u if u attack them. As for the beastmaster himself (and in general all the human classes from nosgoth), hostile towards hostile vanilla mobs and blockacy of kain mobs and... i want to say can tame his own mobs like ocelots, wolves, horses, etc. Even able to mount the large treshawks and horses. The mountaintop fortress could be contested territory (trying to consolidate 2 mountaintop fortress ideas here so hear me out): think dumah's ash village and malek's bastion. Raiding parties that spawn (either human, dumahim, or hylden revenants) would fight each other to control said fortress cuz it would house a "Soul machine" (possibly multiblock structure? see blood omen 1 and cancelled dark prophecy) which would spawn mobs based on which race controls it (either sarafan armor wraiths for humans, or hylden armor wraiths for hylden, wraith dumahim for the dumahim). The blood gifts would b based on the dark gifts seen throughout the series and the nosgoth game. I currently don't have any suggestions for those right now. As for bosses and corresponding structures/territories think twilight forest where there's multiple of said bosses but the bosses themselves ignore u if u already posses their souls and they don't drop their souls a 2nd time, it would honestly be based on the status of the player(s) if they were wraiths and if they already obtained said souls. On that note for collecting souls and blood; it would again b based on the players' status on what they r. For vampire players their prey (organic only) could sit and have a weakness potion effect applied and whatever keybind "feed(ing)" would b the player would hold it down (can either do up close or no more than 5 blocks away (flesh armor extends this to 8 blocks). For souls it would largely be the same however the souls would hafta be an entity (ghostly enemies would hafta spawn a non-solid copy of themselves upon defeat) that would teleport to the spectral realm after a set period of time. Human and other organic living mobs from blockacy of kain need to leave bodies when they die (that would despawn as fast as leaves when the player is in the material realm) so that way when the wraith player (or hylden souls in the spectral realm) sees them in the spectral realm they could use them to materialize w/o having to be at full health. Vampire bodies r the exception as only vampire wraiths could use them to materialize back (to become a vampire wraith u hafta die as a vampire (w/o using the method for becoming a full wraith) the vampire player will spawn as a vampire wraith in the spectral realm and will have a limited time to find a vampire body to use to return to the material realm. As for becoming specific vampire clan members, the vampire player would hafta interact with the boss of the clan they want to join, the boss would turn them into said clan member, and the player would have traits and abilities corresponding to said clan. (See Alien VS Predator (AVP) mod for blood effects and the bodies of used up facehuggers for ideas). Sorry meant to say redstone signal not redstone flux for the dark/light orbs, and the fire braziers for activating reaver doors, traps, etc. That's alright, I understood what you meant. I do have a couple problems at the moment though, 1 is my time, which I am severely lacking due to personal life and making multiple mods. The second is where to restart work on this mod. As the mod stands, is the way things are done good to build on or should I redo everything that's happening so far? If everything is good then I will do only a few small things at a time between updates, so there will more than likely be lots of little updates as I go. Or just make 1 big update every so often. I actually like both directions but I feel little updates will show more progress. Either way, where should I start on the update, I was thinking about changing how the reaver is obtained, particularly the elemental reavers as I've learned quite a few things developing other mods and can easily track it for each player, as such I may convert the reaver blade itself down to 1 item that changes depending on the player using it. I think that might be the best place to start actually. Yeah I'll do that BUT I do need something small to add into the mod as well otherwise it's a little wasted effort. Quick, pick one of your things (or something new) for me to add in! (I'll do the redstone outputs as well whilst I'm at it). I hope u saw my 2nd long post cuz my vote is for the blood fountains that turns vanilla witches into prophets (that r friendly to humans). A multiblock structure utilizing horned demon skulls (dropped from horned demons of any kind), regular skeleton skulls (perhaps add an enchantment for beheading to get mob heads/skulls) and a brewing stand at the top then the whole structure would turn into the fountain as seen from blood omen 1. Most spawn naturally in caves or in forests, though a player could take it apart then rebuild it, maybe b able to place a lever next to it to turn off the flow of blood. I agree for the reaver on how to get it so instead of crafting the reaver maybe perhaps u hafta get the materials for the reaver and deliver them to a "vampire blacksmith" mob which spawn in spawns in swamp mansions (not gonna call him Vorador just for the sake of players who don't know the series) and he'd trade u back a basic "reaver blade" (he also functions as a weapon smith & tool smith for the mod items).Perhaps u'd need to give him, an iron sword, a diamond sword, a vampire bone sword (strong as a stone sword crafted with 3 bone down the middle, large vampire teeth on upper left and right corners, small vampire teeth on the middle sides, and vampire bones on the bottom corners), slime ball, an obsidian sword (u could easily add these in to ur mod) and a blaze rod. After that u'd hafta take it to a "reaver guardian" (again not gonna use a character name even though we both know that's janos audron) to be turned into a "Blood Reaver" (the reaver guardian essentially functions as the librarian and enchanting table for the mod weapons and will sell u mod specific enchantments; when enchanted on the blood reaver they function for a limited time indicated by a durability meter). Ur gonna need to make "glass energy spheres" crafted by an ender pearl in the center, 4 glass in a cross pattern around the pearl, then vampire teeth in the corners (allow quartz spheres from witchery to be used as a substitute). These will b used to hold the light orb and dark orb energies, or be used as a crafting ingredient for spheres of energy used for defiance portals, or even the pearl for mobius' staff. to hold said energy for light and dark u'll need the stand from defiance (which should act like the grasspers from witchery), 3 gold ingots on top, 2 on the bottom corners, lapis lazuli on the middle bottom, then gold nuggets in the remaining spaces. Obviously these will need to emit redstone signals maybe at different rates depending on what orb it holds. Basically place a stand then an empty orb, use desired light or dark reaver to give it light or dark energy respectively. Light orb obviously emit light, while dark orbs spawn friendly weak shades, but when crafted together make the sphere of energy for defiance portal. The portals rather should be a mix of sr1 and defiance portals, i'll think on it later. As for the elemental reavers... i had idea that they should come in 2 tiers; the sr2 weaker temporary tier 1 and the defiance permanent tier 2. To get the wraith blade in the first place u would hafta kill 8 revived vampires and they would spawn vampire wraiths upon defeat but attacking them with the blood reaver turns them into item form that, when crafted around the blood reaver it would craft the "basic soul reaver". U would hafta equip a mob like a golem that can use weapons (i.e. a bound soul, or equip a vampire golem with said sword) with the basic soul reaver then kill said mob with another basic soul reaver to get a wraith blade tier 1 and a broken soul reaver. the tier 1 blades if they r all the same item just changes icons and effect when used with different fonts is fine, however the player would hafta craft and drag the fonts around (which u should change the recipe to cauldron on center bottom, glass energy sphere in the center, large vampire teeth on bottom corners, obsidian on upper left corner, redstone lamp on upper right, then the dye on top middle). As for the tier 2 permanent defiance version i haven't thought that out yet... perhaps something involving the spirit vessels from defiance and the elemental shades from sr2. up to u on either just updating or overhauling. Wow, just wow. You have so much more knowledge about Legacy of Kain and a fantastic view on how to incorporate it into Minecraft. I think I'll probably be using most of those ideas and you will of course get credit. I would like you to clarify on some things though. 3. Tier's of Soul Reaver. I ask these as I've never heard of the defiance portal and the sphere of energy would be crucial to it. The 2 tiers of soul reaver, how would this work? what makes the sr2 versions weaker and temporary? I know in SR2 they used the forges which could be great to have in-game, exploring and finding them and upgrading the soul reaver (saved to the player). In defiance the player had to kill the wraith gaurdians, now these 2 styles are separate enough for me to warrant making 2 methods BUT I would need to know what defines the difference between tier 1 and tier 2. I would prefer to have 1 method for permanent reavers (i dont think theres enough abilities to split them up). You did say you were still thinking on it, which is good. I can't gaurantee Blood fountain immediately but I will promise it'll be added eventually. I don't know how to make multiblock structures yet but there's lots of guides. And i did read the 2nd long post. I'll get to work on things as soon as and see how well it works afterwards. As a note, the witchery compatibility, I like the idea, I wouldn't mind more like that, I will need to learn how to make them compatible though. I'm sorry let me clarify. In Defiance as Kain explores the vampire citadel he uses portals to get from each elemental reaver forge to another (and back out to the outer areas of the citadel). In one chapter of the game Kain has to find a power source for a portal that is missing its own, so he goes to an area that has a broken portal but with its power source still intact. Raziel uses similar ones but those can be locked out by puzzles. My idea is to merge the portals from Defiance (that require the sphere of energy as a power source) and the portals from sr1 that can let u cycle thru other portals you've visited for fast traversal. While the concept is sound (if I do say so myself) I'm not much of a modeler/texture... I lack artistic talent but i'm very good at descriptive imagery. In sr2 u visit the forges to obtain them, but they only lasted until u visited a font of their elemant. If u went into the spectral realm and then return to the material realm u hafta find an elemental font u want to imbue it again (tier 1). In Defiance once u forge the elemantal reaver u keep it and can cycle to it whenever u want so long as u r in the material realm (tier 2). As I commented on e'lohem's mod review video on youtube i mentioned an instant reaver switch device (which could b used strictly for the tier 2 reavers). I'm not a coder either so I'm honestly not sure if this could be doable for u. Either way though if u do make both tiers; the tier 2 reavers should b obtained/crafted in a similar way as to how u get them in defiance; by fighting wraith guardians (however for light and dark elements i recommend adding in elemental shades) then their souls r collected by a spirit vessel. I was watching a walkthrough video for bo1 and in the spirit forges that young kain visits... the wraith smiths have what appears to be a blood altar from the blood magic minecraft mod, so i kinda want to look into that (especially since it deals with blood which fits with vampires). The portals in defiance do ring a bell, it's been a while since I played any Legacy of Kain game, but for research purposes I could play through the storyline >_>; ... yeah. But yeah, the portals ring a bell and instead of having several types of portal (unless I make 2 portals, 1 being limited to it's connected one, and the other being like sr1 where it's any previous visited, both are fine to me) keep it neat in 1 design. Making a portal would help me with my Jak and Daxter mod as well, I have a vague idea how it can all work, just keep a list of active portals saved to either the player or the world itself, i'm more inclined to keep it limited to the player but also have a check against the world itself to verify if there is still a portal there, otherwise issues could happen. A spirit vessel, would that be an item or block that you place before killing a wraith guardian? (or elemental shade). Back to me not playing Defiance in a while, I completely forgot about switching powers for the Reaver in Material world at will, this would definitely be an upgrade to warrant the 2nd tier, i personally like that you have to use the fonts themselves though. 1 thought here though, would you first have to imbue the reaver at a forge before killing a Wraith Guardian or could you go straight for the Wraith Guardian and the 2nd tier? Have no fear about instant switching the Reaver I could keep that all nice and neat inside the Reaver blade itself, I've learned quite a bit about advanced Item data and how to control it so presuming it all works how I want it to, I can get everything working smoothly. Of course you can still switch to the elemental reavers using the fonts with tier 2 though right? why remove that right? my vote is for the sr1 kind of portals. yeah i even though i still have my old systems and games, i don't want to set them up and play them over again when i'm busy w/ irl stuff so i just watch walkthroughs. the spirit vessel is the metal cylindrical stand u see raziel imbue his reaver with new elements from in defiance. in this case it would collect the souls of the wraith guardians or shades (i guess for these mobs in particular the souls r entities which a wraith player cannot feed on). i guess it would be an item maybe 3 blocks high crafted from 2 elemental fonts on top and bottom center then 3 iron bars across the middle of the crafting grid. Then redstone in the corners to allow for barriers when redstone connected to light/dark orbs or fire sconces/braziers (like when raziel obtains the earth reaver in defiance). Maybe give it a GUI with an inventory of 2 elemental soul slots and to enable barriers around it when given a redstone signal, and when it checks for the correct soul recipe to give a check mark for reaver imbuement of a whatever element the player is trying to craft. The fonts r good. The player would hafta make the tier 1 reaver of the corresponding element they r trying to obtain then imbue their tier 1 reaver with the souls of the tier 2 version to upgrade the reaver into the tier 2 version, but yes still allow for switching elements by fonts. (I.E. im playing and i already have the tier 1 versions of all elements then i make the spirit vessel, kill 2 dark shades it collects their souls then shift-right-click it with my dark reaver tier 1 and upgrade into the tier 2 version, but then later i use a light font to switch to my light reaver tier 1. Then later i upgrade to light reaver tier 2 but there's a nearby dark reaver font and just switch back to my dark reaver tier 2 by using it cuz i'm feelin lazy and don't want to hold keys down to switch reavers). I haven't thought about other uses for the spirit vessels aside from collecting other mob souls that drop nearby it when it's placed down (so give it a regular chest size inventory space for souls only)... also witchery adds in spectral stones which capture spectral undead ghost type mobs from its own mod, yet the EnderIO & Soul Shard mods let's players capture souls of mobs (by a soul vial or blank soul shard, respectively) so maybe some compatibility should be present for them later on like being able to place either of those items that have souls in them in like a soul extraction slot or something; the soul inside the item will go in the spirit vessel's inventory (maybe for wraith player consumption or re use by other mods) while the item that was holding the soul reverts back to what it was b4 capturing a soul (such as an empty soul vial). 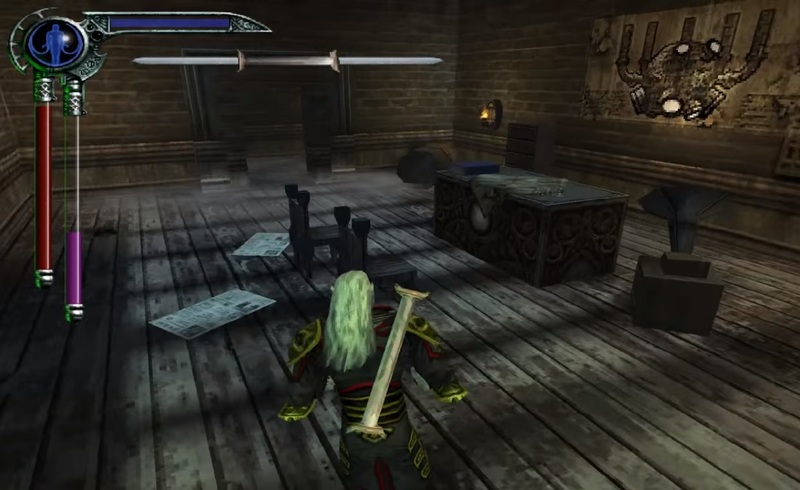 Hey I was watching a walkthrough for Blood Omen 2 and I saw this and I thought "a phonograph? could be an upgrade for a jukebox and have it play different soundtracks from the series". By the way I did a search here in the forums, Blue_Jerry3 is working on a legacy of kain map. I guess now is as good a time as any to update people on the mod as well as respond. First off, thank you Elohem for your series with the mod in, honestly the only person I've seen play that has used the mod itself. As for the basin's crashing your server. A crash report would help greatly to find the issue, it might even be fixed already in my eclipse workspace but it would still benefit me. Now onto the mod itself. I have re-coded the reaver, I'm not happy with some of it but it's workable and still has all the powers from before. I even made it far more streamlined I hope. I have preliminarily added elemental forges, doors, and plinths. No models and not even usable but I've added the basics for them. The blood fountain has also been added but again, there's nothing there except a blank block for now. In all honesty I haven't done much work for personal reasons so I won't go into it however I have been doing bits here and there when I get a chance. I have been thinking recently about the Glyph's from Blood Omen 2 and how they could be used to fuel redstone machinery or things like that, Thoughts? Another question, 1 that I've already asked Elohem, is about the Reaver Doors, he's given me his thoughts but what do other people think? 3x3 was my original thought, then 3x4 to give it the height, but a 4x5 sounds like an okay size too, but again, so does 3x5. Elohem suggested either a 3x3 or a 5x5. Final size won't matter as I can scale the door itself and create several versions, but wondering what people think about it. I'll keep you all updated on progress this time as and when it happens. A final point to Drakepire, I will add a phonograph, it will literally be a copy of jukebox though as I have no idea how else to expand on it just having a nice looking model. If you or anyone else has an idea on how to make it more than a jukebox, I'm open to suggestions. Forgot to mention that I have managed to "lock off" the elemental reavers unless you've unlocked the upgrade for it, this will be limited to each player so you couldn't swap reavers with someone on multiplayer and both expect to use a power you haven't unlocked. Still working on unlocking them (codes ready, I mean in-game) but I won't restrict the mod too much. @KnightDemon glad to see ur finally back. While you've been gone i've been writing pages of ideas that could be useful for this mod if u'd like to see. Maybe the phonograph could've have a GUI pop up like with the Auto-Jukebox from Minefactory reloaded; the player could press the play button and depending on what settings the player has the gui set to it either play the vanilla track on the disc that's loaded or play a track from the series based on what track the vanilla disc is (obviously for a track that has a spectral version it would hafta be played in the spectral realm, which to do so a player needs to interact w/ said block using wraith blade). The crafting recipe could be a jukebox + 3 gold ingots + bone + vampire tooth (any size). If it would be easier to just add in more music discs with soundtracks from the series then fine but in order to play their variations (like combat or spectral or spectral combat) then the player would need to use the jukebox. As for the reaver doors, so long as it splits down the middle to open up.... doesn't matter but i vote for 3x4 or 3x5; it should be at least 1 block taller than it is wide. On that note design-wise visually I suggest the reaver doors from defiance (u would just need to make reaver doors for the balance emblem fragments maybe)? As for glyph energy and related items they would need to be at a higher redstone signal level than anything reaver-related. The obvious generator for would be the mass. I'm not good at redstone-related things but I have a friend who is so I might get back to you on that. Elohem what is this series of yours that you've included w/ the mod? is it on youtube? if so i'll give it a look. Stonecutter: (iron swordx2 + furnace + redstone) used to craft special mod stone blocks and stone mobs. Spikes: 2 iron ingots + 2 wood plank blocks + 2 stone pressure plates and a piston in a U-shape. They can b placed upside down and act as a slab while inverted, or placed on walls. Spikes protrude when given a redstone signal. Observer: 3 cobblestone blocks on top and bottom, nether quartz on far right then redstone in remaining slots. Runage Energy (WIP): an all encompassing magic system for TK, spells, eldritch, rage, and form change usage/powers. This ability is inherit to vampire and wraith players (would work possibly similar to mana from botania). Capacity is increased to a max of 30(?) runes (made by the stonecutter). TK artefact: treated as a spell, grants player telekinesis. This is an item; cannot be placed, does not despawn, and is added to the player’s Soul Tab. Energy Runes: used to increase runage energy capacity. Like the Clan Crests, they must be crafted by the stonecutter, but then filled w/ souls via soul machine and spirit vessel, then surrounded by 4 each of dark and light orbs (alternating, in a circular pattern, w/ rune on pedestal in center), then 3 blood vials broken (thrown) against it to awaken it for use. When active, item is immediately consumed upon pick up. Mist & hot steam generator: used by vanishing brides and vampire players to assume a mist form for invisibility and intangibility (w/o having to spend runage energy). Can blast hot steam to burn vampires: furnace + bucket of water + blood beaker + runestone + magma cream + iron bars + Weighted pressure plate; runs on (buckets of) water being heated by fuel or w/ a redstone signal. Mist will flow like water but will not push blocks or entities. (Mob) fluid drain: 8 iron bars around a runestone (or an XP drain from openblocks mod + (empty) Life Beaker. When a mob is damaged by a non fire based attack, it collects and drops fluids (such as blood, mooshroom soup, milk, liquid slime, water, ink, lava or XP) onto/into the block bellow it. Currencies: Gold Kronah coins (created from a gold nugget, yields 3) traded by mod humans, runestones (prismarine block in the stonecutter gui; yields 16) traded by vampires. Iron tooth Signet ring: vampire fangs + iron nugget + netherrack to craft. Summons Vampire Blacksmith (Vorador) sells mod exclusive "vampire weapons". Golden Ouroborus: Summons Vampire Reaver Guardian (Janos Audron) that acts as a priest, librarian, and an enchanting table for vampire and wraith players; crafted w/ 3 golden nuggets and a snake corpse. Red Heart Relic: Turns reaver guardian into "The Beast" (hostile boss mob to hylden, demons, and humans) dropped from red blooded enemies (10% chance); cannot b consumed by player. Blue Heart Relic: Turns reaver guardian back into original form or bald triple winged form when given relic while in original form, dropped from blue blooded enemies such as ghosts (10% chance) heals wraith player by refilling soul points when consumed. Green Heart Relic: Corrupts reaver guardian who spawns hylden revenants (hostile boss to all mobs except hylden) dropped from mobs that can inflict poison (except for witches, 10% chance) acts like rotten flesh when consumed. Black Heart Relic: tradable item from reaver guardian in exchange for runestones and/or golden apples, restores blood points upon obtaining; (crafted from red, blue, & green heart relics). Blood beaker(s) (crafted w/ empty bottle + bone meal + wooden button (stackable by bottle contents)): right click a corpse w/ an empty Blood beaker for later use to refill blood points. Mob corpses display (filled) Blood beaker meter indicating how many bottles left that can be filled (meter displays blood color based on what the creature is). The Dark Scripture: guide to the mod (name comes from item Raziel retrieved in Avernus cathedral). Player starts w/ it; Book + blood beaker + ink sac + runestone. The book is readable and has both mod-related crafting recipes, information on mod items & concepts, an updating map, as well as instructions on what to do (in relation to the mod), and directions to the Pillars of Nosgoth. Menhir Standing stones: used in multi-block structures to artificially generate planar portals, used by summoners to summon spectral mobs controlled by them. Alchemy Table: 3 empty bottles + 3 wooden pressure plates + 3 wooden fences. When placed down used to convert witches (when they enter its radius) into a "Red Sister of Anacrothe". Found in empty villager houses bigger than 3x3x3 interior space. ANIMALS: all animals drop their skulls that can be used in multi-block structure for beast-masters. These animals have either been seen or depicted throughout the series. Frogs: found around water sources, eats flies and moths, drops slime (10% chance) and frogs legs to be cooked. Moths: drawn towards light sources, eats cobwebs & webbed walls, drops bug wings occasionally and moth grubs (item) that also eat cobwebs and eventually mature into adult moth forms. Deer: hunted by wolves and bears, drops venison, eats grass like sheep. Bats now drop bat wings used in crafting and potions (compatability w/ xeno's reliquary), can be crafted into leather on crafting table. Vultures: Attacks zombies & zombie horses, eats rotten flesh & zombie corpses. Seahorses: can be tamed and ridden like a horse while underwater (eats fish) and given saddle and horse armor (even w/ the escutcheon version). Owls: Hunts arthropods, rodents, fish, and chickens and will perch in trees, or on fences, pillars, bird perch stands, or burrow out a den. It repels endermen, arthropods, and can be tamed w/ spider eyes. Upon death it drops feathers and /other/ bird meat. Goats: behave like sheep but will attack when provoked, drop same drops as sheep. Rats: chews thru (opens) wooden chests and eats food items, drops rat meat. Black Bears: same as polar bears except found in taiga biomes, eats & drops fish. Lions: male and female found in grasslands, can be tamed into a cat by non-beastmaster players, hunts deer, sheep, and rabbits. Upon death drops venison, sheep, or rabbit meat. Crows and ravens: crows summoned by scarecrows, heal by eating corn. Ravens summoned by vampires, can be used as a spying device, heal by eating rat meat. Both drop feathers and corvidae feet used in potions. Tamed Ocelots (cats) now actively hunt nearby rats even when sitting but will then sit once rat despawns. FOOD: frogs’ legs, biscuit, beer, venison, rat meat, /other/ bird meat, & cheese. FACTIONS: Human, Demon, Vampire, Hylden, Elder God. Sub-Factions: Ancient vampire, Vorador, Kain. Pillars of Nosgoth (update); found in flat grassland, only the base is there and player must make the pillar icons, once crafted and placed at the appropriate height the quest book will update: right-click the quest book on each pillar icon to receive a map to the lair of each corresponding pillar guardian “boss”. Once the human counterpart is killed, the map will update to show a map leading to the tomb of the corresponding pillar alignment predecessor that a wraith player must kill. Once all guardian bosses are killed (both human and spirit vampire) any player w/ either a physical reaver or a wraith blade can go to a pillar and receive full runage energy for an appropriate reaver element/alignment the player is currently using. Pillar Guardians; there’s the Necromancer, the Druid, the Alchemist, the Summoner, the Mentalist, the Paladin, the Energist, & the Time-streamer. Killing these human bosses will “restore” their corresponding pillars they r attuned to and “disturb the rest” of their spirit vampire predecessors for the wraith player to kill, obtain their souls for use in a spirit vessel to receive elemental wraith blade upgrades. Drakepire... I can see you're excited and want to contribute, but you need to slow down. Lots of ideas can be great, but having so many all at once is a bit daunting. Several of these ideas, despite being small are irrelevant in this mod. I could always make a small side mod that can have things added to it, however all the animals and plants don't really have any reason as far as I can tell to be added into Blockacy of Kain. The recycled Minecraft ideas don't fit in here either, you've given 1 of them a nice use for the mod, in using it to create mod only blocks which I don't have many of yet but do plan to add some. What are these Heart relics and which game are they from? To inform people, I have begun work on the clansmen models, I only have Dumahim's made so far but more will come, I want to have enough to give drops that can be used in the current recipes and then work away from those crafting recipes. The spikes are just a reoccurring hazard seen since blood omen 1 honestly, but i had an idea that they would have different chisel textures and could b placed on walls to essentially be the spike hazards u see in soul reaver 1 and defiance. The stonecutter is obviously for stone-related items, blocks, and mobs for the mod. The heart relics are from soul reaver 2 from the air forge, since they are colored based on the blood colors encountered in blood omen 1, I figured they should be based around said blood colors (i.e. red for restoring vampire health, blue for energy, green for poison, etc) and right-clicking certain colored hearts on certain mobs would have different effects, while the reaver guardian (janos audron) who would trade u back a black heart (think heart of darkness item from blood omen 1) in exchange for runestones (1 of the 2 currencies from Nosgoth, this 1 I affiliate more with vampires). The Beast Masters are from Nosgoth yes, the idea was to have a human mob that could tame and "order" animals to attack other mobs (like the hunters in soul reaver 2). Honestly everything from Nosgoth I was already writing recipes and behaviors for because 1. it's more mobs 2. more items to use, so lots of variety but I'll try not to make them complicated. Yes I understand Nosgoth had different creators but so did blood omen 2 (well a different team), plus it's set inbetween Raziel's execution and resurrection (timeline-wise) and if you go on the wiki it gives you a lot of lore and information that happened inbetween his death and rebirth, at the very least I include stuff from nosgoth because the razielim are only featured in this game. The animals yeah I suppose there's no need when there's plenty of other mods for that, I guess there's easier ways to get slimeballs and their equivalents with all the other mods out there. However the moths were something I thought could be used to "eat" cobwebs like in mineshafts or in zephon's territory (cuz the idea was that Zephon and his brood would place cobwebs everywhere making it difficult to move, so as an item u could right-click them with moths to quickly break the cobwebs). The crows and ravens, well the crows were just a summon a scarecrow (from blood omen) would use to attack, while ravens could be used as a spying device (that was the idea) which could be binded to a viewing basin (the 1 moebius uses in soul reaver 2). The plants well, the corn when cooked in a furnace would give u food or/and b4 fully cooked switch out the coal or other fuel w/ an empty bucket to get oil, which is used to fill cauldrons (free turn ur sticks into torches w/o wasting coal) the gaseous flowers were just hostile entities that a player would hafta kill, though they could be a summon nature guardians could use.The mist & hot steam generator obviously for vampire players when they get the mist form, or blast vampires with hot steam (like in blood omen 2). The Succubus is from the cancelled game "Dead Sun", while I only saw her briefly in a clip, she was swimming in a pool of blood but since I don't have any other data on her i figured she could just be a boss who upon defeat would do something beneficial for the blood fountains. The observer yeah I guess is pointless, any recipe that uses it (like the sentry eye from soul reaver 2 that I already came up with for would use it) could just use an eye of ender instead. The update to the pillars well because i've noticed they're just decoration right now, so having them have a GUI or something and give the player a map to the pillar guardians (both human and vampire spirit ones) kinda makes sense cuz we never discussed the details of how the player would acquire the means to upgrade the wraith blade to the tier 2 versions (aside from light and dark), so directions to guardians which I would assume would be bosses. Honestly i've just been coming up with ideas while you've been inactive, I've been reviewing the games in the series like what could be added as a mob, block, item, etc from each game and then listing them by game. I've already identified several mod only blocks the stonecutter could make. Tell me which ideas you approve of and which you don't (I understand on most of the animals, though being ale to remotely explode pigs and creepers, I honestly like that idea). I have alot more ideas I would like u to look over but I understand you're 1 person and don't have much time so I will cut back abit, i'm just anxious to submit them all to you and any ideas you don't approve of or just have questions about I'll tell you where they're from and my justification for. If you want to send me a file with these in you're more than welcome to, it would be easier for me to look them over but if you honestly prefer to post them here so that not only me and you can see them, but anyone who views the thread can and then talk about them that's fine. Many of your ideas or suggestions are good and I'd love to try them, however time constraints and skills at least at the moment are not up to making them. In future after other things are done I may return, hence why I think a file with all the ideas in would be welcome as I could look at them instantly. As for progress on this mod, I believe I've mentioned that the Reaver has tiers and limited to them, if not, they have. I have also updated the light and dark orbs, with suggestion from Darkpire I have made an glass energy sphere that when placed is empty, but can then be filled with either light or dark energy, you can place a filled one with a command though. The old light and dark orbs have been deleted because of this, and the new orb is see-through, like glass. A new / replacement mob is almost made, my next post will have a picture (or not if you don't want it spoiled) of a Dumahim which will take the place of the normal Vampire, the large and small may remain until an alternative can be made for those as well (unless i just scale the Dumahim). Recipes for the orbs have been removed too and the recipe suggested by Darkpire using glass, teeth and an ender eye has been added. New update and images?! WOW! Will you make the mod for the newest versions too?